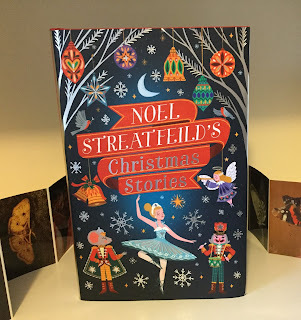 I've been reading Noel Streatfeild for nearly seventy years. If you ask any woman of my age which were the important books in her childhood, chances are that Ballet Shoes will be one of them. It ticked every single box for me. I longed for siblings, I longed for the limelight, I loved performing and the adventures of these sisters and the adults who surrounded them became a kind of ideal for me. This little book, beautifully produced by Virago in time to take its place under many Christmas trees, is illustrated by Peter Bailey, with delightful decorations at the beginning of each story and black and white sketches throughout. It's a short book. There are nine stories of just the right length to read in bed at night. Just the right length to be read aloud, too, and Streatfeild reads aloud very well. The tales have a Christmassy and theatrical feel to them. There are pantomimes, Christmas shows, performances of one kind or another that the young heroines are ambitious to appear in. In one story, a girl takes the place of her father who's been playing a goose in pantomime for years and years. He falls ill just before the first night and she steps nobly into the breach. There's a story where fictional characters from children's books come together to raise a sick child from her bed, in the nick of time. Incidentally, the list of books a child of about nine has read and calls upon to help him is most impressive. Old people are helped, parents are hard-working and not very rich, there's a wonderful trip to the country for two London-bound children and there's always a happy ending, which is always welcome, especially at Christmas. And throughout, there's a strong sense of Streatfeild's own preoccupations: the theatre, the relationship between siblings, and parents and children, and in the background the strong atmosphere of London between 1949 and 1962. It's a very different world from the one we inhabit now, but still one that today's young readers will enjoy enormously. The language is plain, but Streatfeild has the gift of evoking a place and characters in very few, well-chosen words. The stories can be enjoyed by children as young as eight or nine, and their parents and grandparents will enjoy reading them as well. Anyone who finds this under the tree will be delighted. What a delightful book discovery,Adele, and in time for gift-giving, even to oneself.